If trees could talk, this old lady would have a lot to say. 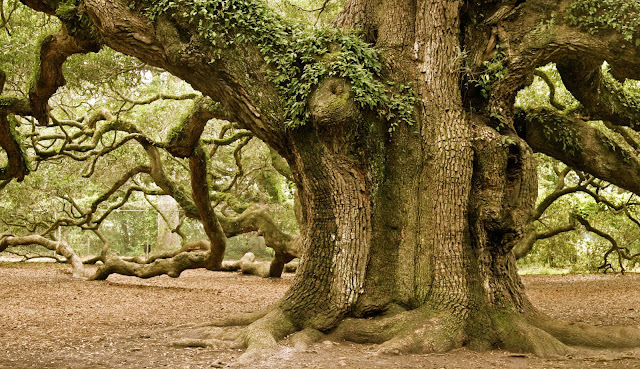 The Angel Oak is located on Johns Island, SC in a quiet wooded area. The Angel Oak has a shade of over 17,000 square feet and is predicted to be over 1500 years old. The tree is said to be the largest living thing east of the Mississippi. Growing up in South Carolina, you see a lot of gorgeous oak trees. I have never seen a tree so big. The Angel Oak is truly breath taking. Can you imagine all the things this tree has weathered? I have heard people say that you should travel to the Grand Canyon, look down and see how insignificant you really are. Well, travel no further than the Carolina lowcountry and stand under a tree that has been around for every hurricane in the past 1500 years. That's a pretty long ride. Take a trip out in the water and drive your boat so far into the ocean that you can't see land anymore. Sit over the gulfstream and think about all the animals swimming around beneath your boat. It's comforting to know that we cant change the world.